Rowman & Littlefield Publishers, 9781442208827, 268pp. 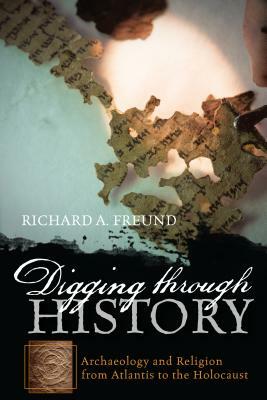 Digging through History follows rabbi and archaeologist Richard Freund's journey through some of the most fascinating archaeological sites of human history--including the mysterious Atlantis, Qumran and the Dead Sea Scrolls, and the long-buried Holocaust camp Sobibor. Each chapter takes readers through a different archaeological site, showing what we can learn about past religious life and religious faith through the artifacts found there, as well as what has given each site such strong "staying power" over time. Richard Freund and the research in Digging through History are featured in the National Geographic documentary Atlantis Rising, which premieres on National Geographic on Sunday, January 29, at 9/8 central. The documentary follows Oscar-winning executive producer James Cameron and Emmy-winning filmmaker Simcha Jacobovici as they investigate the myths and realities of Atlantis. Digging through History is the only book that details Freund's groundbreaking research on Atlantis that is featured in the film. A free app, "Archaeology Quest: Atlantis" is also available for iPhone and Android users who want to explore Freund's newest information on Atlantis. Richard A. Freund is Maurice Greenberg Professor of Jewish History and director of the Maurice Greenberg Center for Judaic Studies at the University of Hartford. An archaeologist and ordained rabbi, he has been featured on National Geographic, NOVA, CNN, and the History and Discovery Channels. He is the author of several books, including Digging through the Bible, and he lives in Hartford, CT.